The national bird of Uganda, the crowned crane gets its name from the stiff feathers that stick straight up from its head. This “crown” makes the crane appear even taller than it truly is. Its long neck and legs, coupled with its excellent peripheral vision, helps it to spot predators in the tall Savannah grass. Conservation Status: According to CITES App. 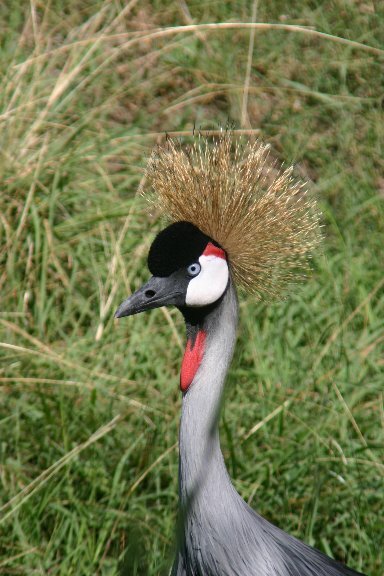 II, the African crowned crane is a threatened species. 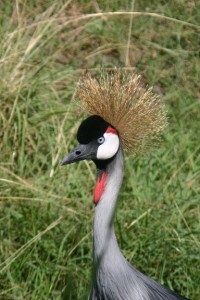 Crowned cranes are the only cranes able to roost in trees.